For our family, the forest is our everyday nature place. We can walk to a forest for daily time in nature; we can drive 5 minutes to a forest — and we do, every week for Forest Freeplay. But at the end of June we spent a few days in a completely different habitat: the beach! The forest tends to be dim, with soft filtered light and a soothing hush. Or it might have a continual throbbing undertone of cicada song. 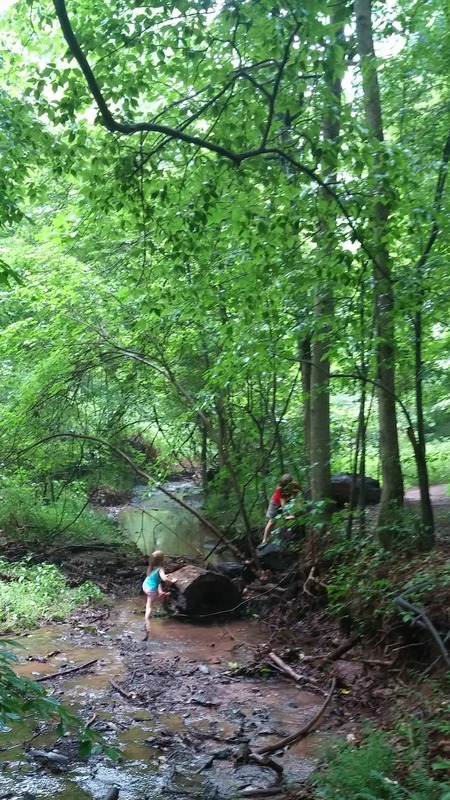 The creek burbles by, and the children can climb on the muddy banks, over boulders, and across fallen logs. Going to the beach provides a natural experience of a completely different kind. The sky is vast. The Atlantic ocean is endless. The water is powerful! There are birds to be seen, shells to examined, waves to be ridden, and salty water to be tasted, and the sand — oh, the sand. I think it is still coming out in the wash. There is much to be said about the importance of connection to local places — Hunting Red* is just such a story! Exploring completely new habitats allows you to come back and see your own familiar nature spaces in a delightful new way. Where will your nature explorations take you this summer? *Hunting Red is PocketMousePublishing.com‘s own book! It can be purchased through Amazon‘s affiliate program: full disclosure here.